This is the glass I cannot throw away. It sits next to my sink. I can’t use it (the glass, I mean, not the sink) because the girl-in-question gave it to me. At the same time, I can’t bring myself get rid of it, and I don’t understand why this is so. She gave it to me the last time we saw each other. It was on my birthday, when she gave me a motley little collection of gifts. I’m pretty sure the grey nail-polish (if not the rest of the package) was a re-gift, but a twenty-two-year-old on welfare with two children doesn’t have time or dollars to spare, and I thought it was nice of her to give me anything. She gave me a card, too, that she had drawn herself. It was drawn in only blue and black pen (oddly limited for an artist), and was torn, so I figured she’d drawn it in haste ten minutes before leaving to meet me that morning. Even so, the picture was sweet, and her message actually made me a little weepy. She wrote, “Thank you for standing by me in good times and in bad. Hoping one day to return the favour.” No one, in all the beastly years that had gone before that moment, had said thank you. It meant so much to me. Four months later she messaged me to tell me never to contact her again. There were other gifts. I would have kept the canister she’d given me the previous Christmas. The canister was orange, and it said “Tea, unless something else in which case that.” It was magnificent. It was ruined by extremes of weather and my brute strength. A keyring lasted, too, but got tossed when I changed wallets. But not the glass. It waits by my sink, with dishwashing liquid, sponges, and the tea and coffee grounds I collect for the garden. What is it waiting for? It just sits there, staring at me and gathering slime, until I feel bad about the slime, and wash it, thinking, this weekend I’ll take it to Vinnies. And then the weekend comes, and I don’t. How can an object which carries the history it carries and represents what it represents, be sent to an op-shop to sit on a shelf with people’s eBay regrets and cracked porcelain? Yet there is no reason to keep it. It’s not a magical beacon, soundlessly emitting rays of goodwill which will one day prompt a word of apology and a weeping reconciliation. It’s not a weapon. I’m not allowed to throw it at his head. But the lid has holes in it, so I can’t use the jar to preserve anything. 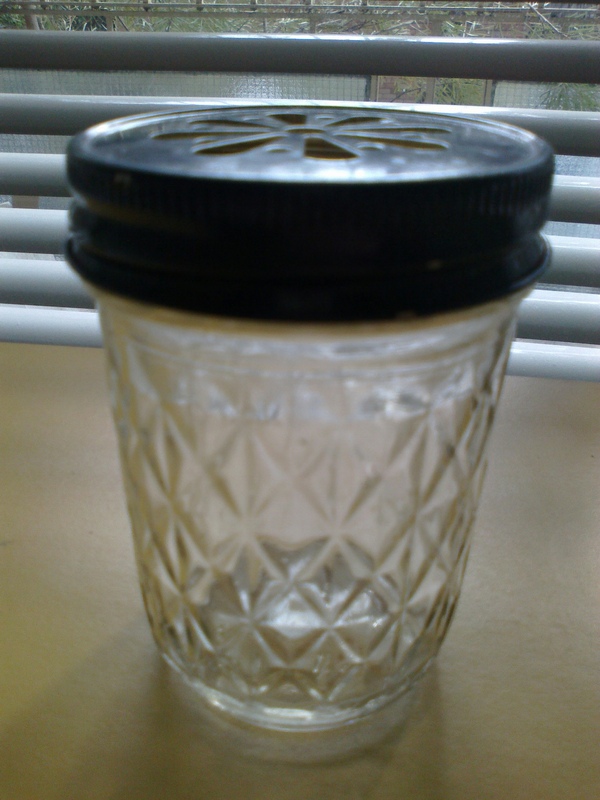 The glass is too thin for melted wax, so it won’t become a candle. And in any case, I don’t really want to look at it or use it. I just don’t want to throw it away. Is this a weakness or a strength of heart? It’s impossible to tell.